This Letter to the Editor appears in The Southampton Press, July 27 edition. Seventeen of the 24 Long Island association libraries allow trustee elections. Westhampton’s board members intentionally deny taxpayers their right to vote [“Library Trustees Cap Term Limits,” July 20]. What’s the magic number of community activists necessary, self-appointed President Tom Moore, for this diversity-lacking private club of friends, comprising three teachers, three lawyers and one insurance agent, to grant local taxpayers their American right to vote? Is it 43? 87? Many reasonable and fair self-appointed association library boards decided on their own that trustee elections were right and democratic, and amended their bylaws to allow elections—no “great numbers” of community activists necessary. Shelter Island’s library board did just that, in 2011, for example. Dozens of taxpayers attended monthly board meetings nearly two years ago, but this self-appointed board never allowed the elected board issue to be on the agenda via an open, welcoming community discussion. There’s only so much we can do for so long, and this issue isn’t as visceral as viewing monster telephone poles or worrying if contaminated groundwater is compromising our family’s health. Why must we cajole and convince the board to do the right thing in democratic America anyway? This isn’t authoritarian Turkey. Well, it is at the Westhampton-Not-Free-For-Taxpayers Library. An 1897 charter grants the library private corporation power, though multimillions of tax dollars fund the library’s annual operations. Women and African-Americans couldn’t vote in 1897. Now, in 2017, why do unelected individuals alone determine who has the “right motives”? Are we taxpayers too stupid to vote for a library trustee? We’re the same taxpayers who elected your wife village mayor, Mr. Moore. In this recent village trustee election, the two incumbents ran unopposed. We still conducted a fair-and-square democratic election. Allow library elections. What are you afraid of? What are you hiding? Why the need to maintain absolute power? Elections provide accountability and transparency. Didn’t you have to resign in 2010 from the Westhampton Beach Village Zoning Board of Appeals, three years before your term was set to expire, due to lack of transparency, Mr. Moore? 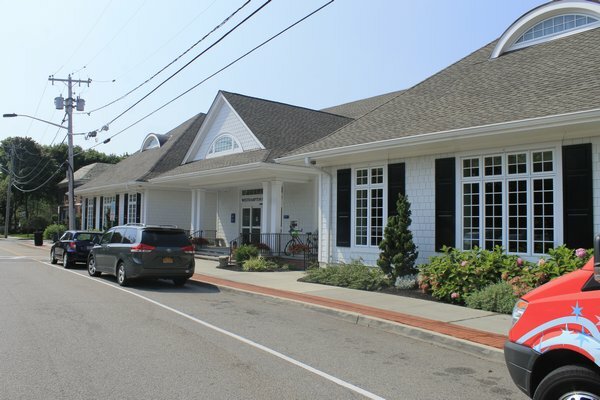 Newly appointed library trustee Steve Wisnoski made two unsuccessful bids for the Westhampton Beach Board of Education in the past three years. Democracy is dead at the Westhampton Library. America is founded on representation with our taxation. If the school, village or fire boards said, “No more elections, the current boards will self-select who can serve next,” taxpayers would be furious. The library is a private club that my family pays nearly $600 to annually. Every taxpayer pays to fund the club, but only the self-appointed, unelected trustees have voting rights. Election Update: The Westhampton Free Library budget passed 360-185. The school budget passed as well, 448-99. The Westhampton Free Library budget increase vote is Tuesday, 5/16. Every vote counts! It’s great to see democracy alive and well at the Westhampton Beach School District! Lawn signs are sprinkled about town as three candidates vie for one open Board of Education spot. Guess what? There is still an open trustee vacancy at our Westhampton Free Library, since November 2016. At least three eligible taxpayers have submitted “trustee applications,” but the six SELF-APPOINTED trustees don’t want them in the private club. 17 of 24 Long Island association libraries already permit trustee elections. The Westhampton trustees are in the unique minority simply by refusing to allow trustee elections. The self-appointed library trustees—Tom Moore, Susan Rosenberg, Barbara Matros, Robert Santucci, Mary Anne Yutes and Mitchell Schechter—are collecting over $3 million in taxes for the library’s annual operating budget (the $2.2 figure above does not include the revenue collected from the contract districts)—on top of the already $4 MILLION IN CASH sitting in the bank accounts. I do not agree with taxation without representation. I believe the attic expansion and first floor re-design—on our BRAND NEW BUILDING— should go out for a community vote. I also believe the employees should come before the building and if the budget is voted down we taxpayers know there is plenty of money to keep them all employed and for the union to negotiate an objectively fair living wage. Present library trustees are free to run for election and elections can be phased in, one or two trustees per year, to allow for board continuity. Plenty of other association libraries have done just this, some decades ago. Notice in the photo above—“Board of Education Trustee Elections” but no “Library Trustee Elections” though we taxpayers are voting on both budgets. I will be voting no to the library budget increase to send a message that I do not agree with taxation without representation. It is wrong. If the board decides to start laying off employees, I hope our community will rally in support of those employees. It’s unfortunate that 6 self-appointed individuals put us in this no-win difficult spot. Possible Conflict of Interest at the Westhampton Free Library?